﻿ Yilin Pension, Jeju Island | FROM $38 - SAVE ON AGODA! Have a question for Yilin Pension? "Pros: near to town and supermarket." 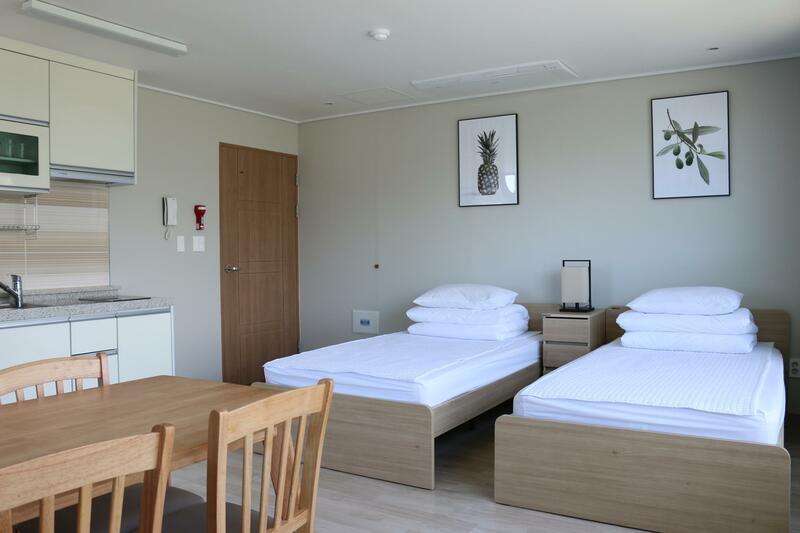 "Very clean, warm welcome, friendly and spacious room and fee..."
Located in the lovely area of Seogwipo, Yilin Pension enjoys a commanding position in the beaches, restaurants, sightseeing hub of Jeju Island. The city center is merely 0.6km away and the airport can be reached within 60 minutes. 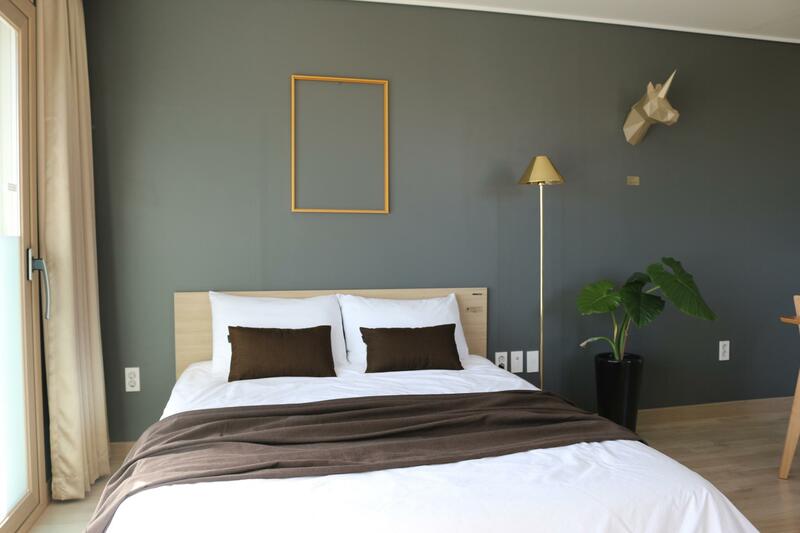 With the city's main attractions such as Jeju World Cup Stadium, Seokbujak Museum, Oedolgae Rock within close reach, visitors to the hotel will just love its location. 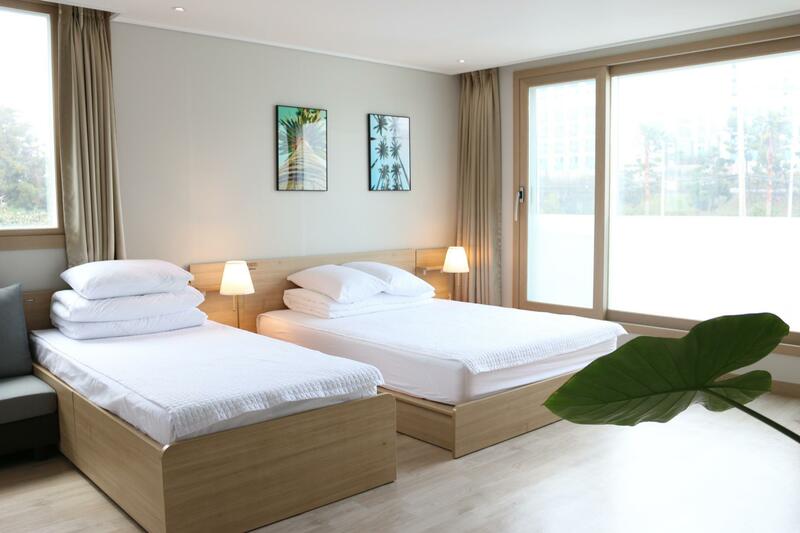 The facilities and services provided by Yilin Pension ensure a pleasant stay for guests. The hotel offers access to a vast array of services, including free Wi-Fi in all rooms, 24-hour security, daily housekeeping, laundromat, express check-in/check-out. Step into one of 10 inviting rooms and escape the stresses of the day with a wide range of amenities such as television LCD/plasma screen, additional bathroom, additional toilet, cleaning products, clothes rack which can be found in some rooms. Whether you're a fitness enthusiast or are just looking for a way to unwind after a hard day, you will be entertained by top-class recreational facilities such as golf course (within 3 km), garden. 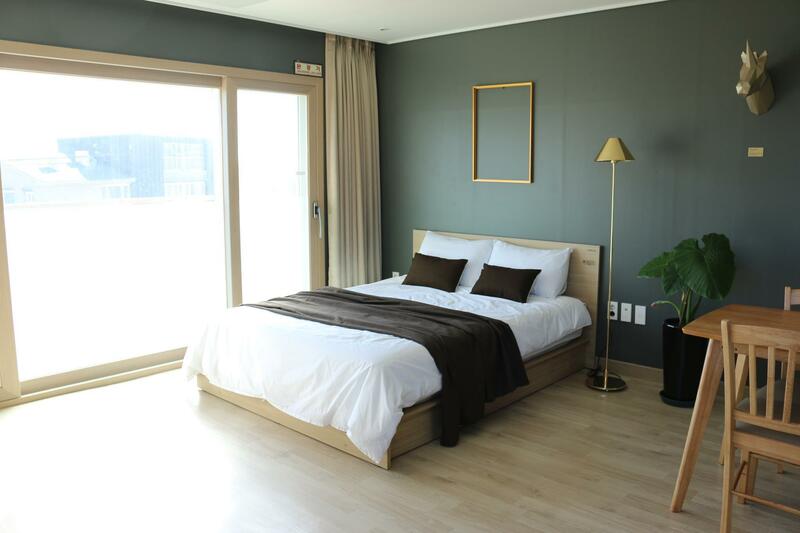 Yilin Pension is an ideal place of stay for travelers seeking charm, comfort and convenience in Jeju Island. 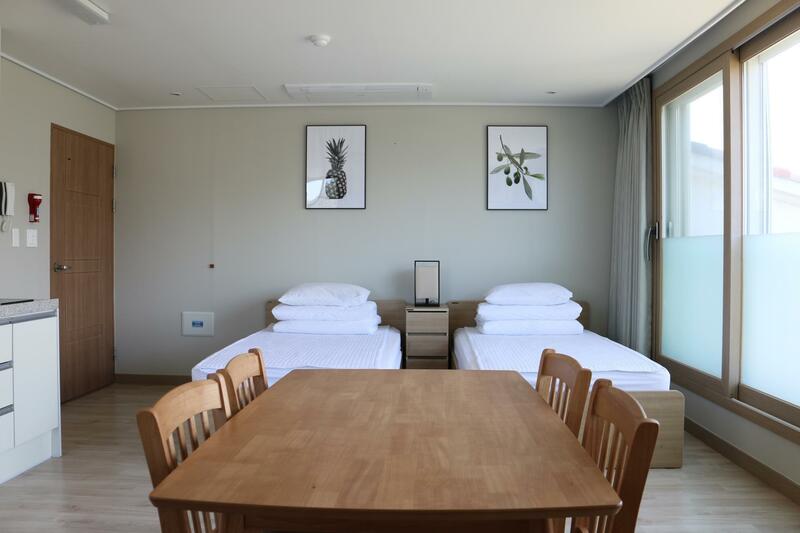 "Room is neat and tidy, will kitchen facilities for cooking." The host is friendly and very helpful You may check with the host regards the recommended restaurant (you will not regret it) The location is great few min walk away from the station and easy to access. This pension house has a spacious location with parking space & barbecue area in front. The rooms were so spacious & fully furnished. Mr Kang, the owner, was so particular on removal of shoes before getting in the room which just makes sense on why his rooms were so clean. There is no elevator but there is a laundry area, a cooking area and free-flowing supply of drinking water. Mr Kang was very helpful with itinerary suggestions too. Food delivery is also possible which is convenient after a tiring day outdoors. It's approximately 5-10 minutes walk from the World Cup Stadium, bus station, supermarket (e-Mart), convenience store (GS 25), Mc Donald's, & Starbucks. There are restaurants as well uphill (with rows of hotels) which is quite a walk. It was just a hassle dragging our luggage to & from the pension house so renting a car would have been perfect here. OVERALL, we enjoyed our stay at Yilin Pension House. We don't mind going back here, if ever, but with rented car. Overall love this apartment. Well equipped for my 1 night stay. Went there with my baby, they even provide pillow for baby. Owner was friendly and even recommended us place to go and eat. Only things is that there is no lift, so will need to climb up the stairs. Our apartment was at 3rd floor. The greatest thing about this pension is that kitchens are available with utensils, seasonings, microwave oven etc... washing machine is available for use too. We went with elderly and as there was no elevator in the building, we requested for the room on the first level (but still some stairs to climb) Emart (a supermarket), Mcdonalds, Starbucks are within 5-10 min walk. We stayed in a two-bedroom apartment for Max. 5 persons, and it was in fact a living room (3 sets of korean style mattress) plus a bedroom (double bed). Both rooms have individual doors and toilets and are connected to a common corridor leading everyone to the entrance. So that we would not disturb each other at night. The pension definitely deserves 6 stars for the value for money! Very friendly owner, lots of restaurant and supermarket nearby. Rooms are large and very clean plus in good condition. Only downside is that there is no elevator. However this is indicated in the hotel description and not a big issue. Definitely recommended. We were pleasantly surprised when we checked into the pension - a big room with well-equipped kitchenette (fridge, sink and induction cooker). The staff spoke very little english but was extremely helpful when we requested for extra towels. And the beddings are really nice and comfortable, one of the best we have stayed so far. There is an eMart nearby where you could stock up food in the fridge provided. The only down side was perhaps, its location. It will only be accessible if you have your own transport. Then again, it is common that tourists rent a car to get around in Jeju-do. We did just that and had no issue with parking. If you are travelling with rented car, we high recommend this hotel for it is totally worth every penny spent. Spacious and clean. They have washing machine at common area. We can also refill drinking water as they have a drinking water machine. Great experience in overall. Thank you! Everything was excellent, except the absence of elevator. The Host is helpful. The room is spacious and clean. This pension is near to the Supermarket. The facilities are ok and complete. It is quite far away from the airport but its location is very nice indeed, you have E Mart nearby as well as convenient stores, Starbucks, McDonald's in walking distance. The room is spacious enough for more than 2 persons, which basic cooking utensils, fridge, microwave provided. There are both hot and cold water supply in the bathroom, but unfortunately, during my stay over there, they only provide us 4 washcloth; instead of 2 towels and 2 washcloth. There was a miscommunication between me and the owner of the check out time but in the end, they provide us enough time to check out even after the check out time was past, I really appreciate it. Room was spacious and clean. Mac Donald's, Starbucks and a supermarket were located within walking distance. So we bought Korean dumplings and cooked for supper! The room was quiet cause it was located away from the main road and the flooring was warm. We enjoyed our stay. The house is big and clean. They provide housekeeping service everyday. The kitchen is well equipped. The host is very nice. Emart is nearby. You can get everything you ned. All make you really feel like home. The only one thing is that there is only one bed in the 2 bedroom apartment. Some of you need to sleep on the floor whom may feel unaccustomed. Clean & spacious room. Helpful host. Value for $. Overall a pleasant stay. Host helped out with the heavy luggages upon our arrival and gave useful tips on where to find food & supermarket. The spacious room was fully equipped with the basic necessities and very clean. Room is also well maintained with clean beddings. Room was super clean! Great and helpful owners that wont hesitate to help us find our way to different locations. Locatinn of pension is near to supermarket and bus temminal. Location of pension is near to supermarket (cuttlefish is soo good!) and bus terminal. Also, it has a lot of buses to go to the tourist places. Do check with the owners before going as jeju transportation can be a little confusing. I would definitely stay here if i ever go back to jeju! We paid less than $100 for such a big room with kitchen facilities. Value for money. However do note that the towels provided are a little small. Location is a bit hidden, especially since we drove there in the night. We missed the drive into the pension, had to do a u turn and keep a lookout for the small street. Otherwise well located as the e mart was nearby. I am traveled in a group of 6. So, we booked 2-bedroom apartment but when we checked in is 1-bedroom apartment with doubled bed. 4 of my friends is sleep with Korean traditional mattress in the living room. Although is not per what we booked, but is ok. The living room is big and is comfortable to sleep in Korean traditional mattress. The most comfy thing is the vinly floor is with heating system. Is so comfy especially night time is so cold. Besides, the apartment is equipped with kitchen facilities. So we can cook our breakfast. Nearby, there's a E-mart supermaket. Is about 5-8 mins walking distance. The Yilin Pension was a good base for our travel in Jeju. The room was very spacious and comfortable although the heating was a little too high during the night. We were grateful of the laundry facilities and the staff were pleasant and helpful. We hired a car so it was good to have parking and good location on one of the main roads. We just caught taxis into Seogwipo for dinner. This hotel is in a quiet area, but not too far away from touristy places. We had a rental car; this is about an hour from the airport. I don't think it would be easy to stay here without a car. The room and bathroom were very clean; very comfortable bed, spacious room. There was a microwave, hot water pot, extra bedding, dishes, and a kitchen. Coming back in from the cold was wonderful because of the ondol heating. I would stay here again, and recommend it to my friends.